Instantly recognisable the world over, the creation of the Beetle by Ferdinand Porsche to Hitler's request for a 'people's car' is now sufficiently well documented not to need repeating here. 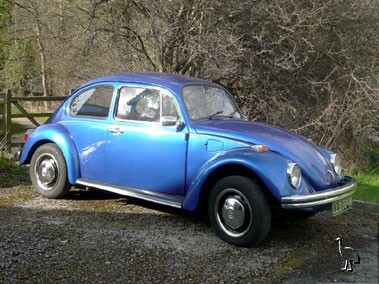 Meticulously developed (over 78,000 modifications are said to have been made) but never significantly changed in appearance throughout its production life, the Beetle's primary strengths of simplicity, reliability and quality of build ensured that it found a faithful following even in the most inhospitable climates. Production of the Beetle ceased in Europe in 1978, after surpassing the previous world record of car production held by the Ford Model T of 15 million in 1972. Production continued in Mexico and Brazil up until 2003, the model having been brought back into production in Brazil it is said at the specific request of an ex-girlfriend of the president! Finished in metallic blue with black vinyl upholstery, this particular example is described by the vendor as being in "good" condition with regard to its engine, four-speed manual gearbox, electrical equipment and interior trim, while he rates the bodywork and paintwork as "excellent". Since entering the current ownership nineteen years ago, 'LLO 564K' is said to have undergone a renovation that cost approximately £2,000. Reportedly carried out by the seller, the work is understood to have been completed during 2003 and to have seen the Beetle treated to the following new parts: "doors, four wings, bumpers, both heater channels, half floor pans, seals and a petrol tank". Further benefiting from overhauled brakes and a renewed interior (except for the seats) this practical yet characterful Volkswagen is offered for sale with MOT certificate valid until April 2011 and historic class (free) road tax valid until March 2011.